Normally a web application is configured to use a single STS for authentication. Using the Identity and Access Tool also pushes you into that direction; there’s no option to set up 2 or more different federated STSs. However, there may be cases where you would like to allow external users to access your application. Who are these external users? A typical example is the users of a business partner; those users will use a different STS to access their own web app. What if you wish to give those users access to your web app without them having to sign up with your app first? After all you don’t want to manage those accounts, right? They are not really your users, you don’t want to be responsible for their sensitive data in your database. You could instead somehow configure your application to accept tokens from 2 STSs: your own and that of the partner company. 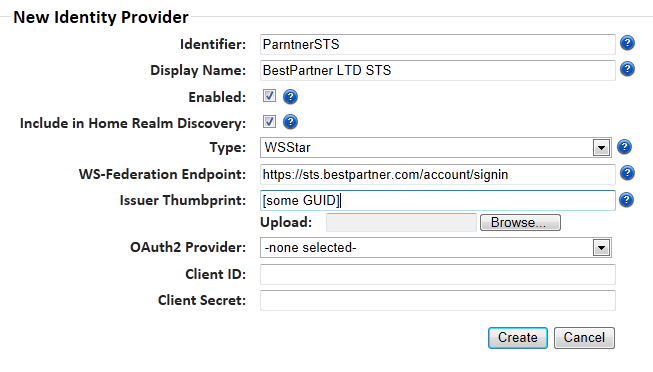 You can designate the STS of the partner as a trusted identity provider. If the external user can come with a token from that other trusted STS then they will be allowed to view your application. The recommended way to implement this is to follow a pattern called ‘Resource-STS’ or ‘Federation Gateway’. Your application should only trust one single token service. Always. This method simplifies the configuration of your web application because it still only needs to be concerned with your single trusted STS. The external relying parties will not need any reconfiguration either. The only application that will need to be adjusted is your STS because it must understand tokens that do not originate from your application. So indirectly your web app will trust the external users. From here onwards we have “business as usual”: the claim is inspected, transformed, saved in the auth session etc. However, there seems to be something missing. The external user will need to navigate to your application first, right? They do not contact the STS login page first and somehow try to modify the URL, that would be impractical. It is your application that should redirect the user to your STS. The additional difficulty is the following: how does your application know where the visiting user is coming from? Which STS should it redirect the user to? The complexity increases if there are more than one external STSs. Even if we establish that the user is an “external” one, then which external STS is theirs? The process of finding out who is trying to log in and where to redirect this user is called Home Realm Discovery. There’s of course no magic way to answer all those questions in the previous paragraph, we simply need to ask the visitor. Are you a partner? Which partner? Are you an “internal” user? There will be a special GUI within your application to ask these questions and redirect the user to the correct STS. A pre-warning: this demo is far from complete as I don’t have access to a second STS. The thumbprint is the certificate signature of the external STS which helps us decide whether the token is coming from a trusted source. 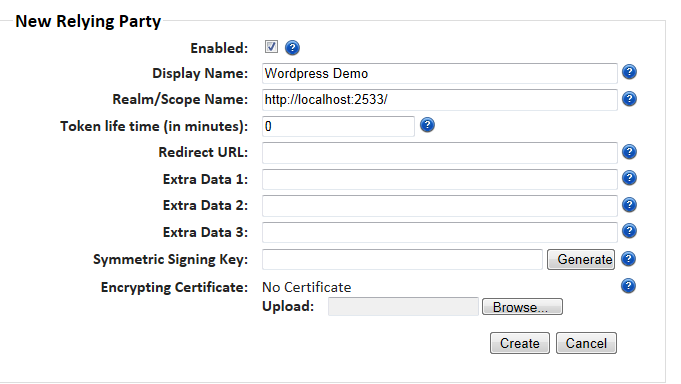 The WS-Federation endpoint is the value of the login page of the external STS, like https://localhost/idsrv/issue/wsfed in the case of the demo project. Other commercially available STSs will also have similar URLs for home realm discovery. As we don’t have any other STSs there’s no point in testing the application really. However, using the hrd link we would land on an interim page where the user can select among the available STSs and pick the one that’s relevant to them. They will then be redirected to the login page of their STS. After a successful login the user will see the protected page of your web application. The homeRealm value will be the ‘Identifier’ field in the Identity Providers setup window we saw above. It adds the ‘&whr=BusinessPartner’ parameter to the STS query string. It tells our STS to go directly to the external STS called ‘BusinessPartner’ and do not show the interim page where the user can pick one of the available trusted STSs. …then this should be a straighforward task. This finishes the entire series of posts dedicated to Claims in .NET4.5. I hope it is enough to get you started with your own Claims-aware web or desktop projects. Happy programming! The next post will be the starting point for an entirely different topic: Test Driven Development in .NET. In the previous post we left off with the shortcomings of the Logout function: we log out of the web application but the session is still alive on the STS. Would like to end all our sessions when we press Logoff on the main screen. Similarly if there are multiple web sites that share the same STS then we would prefer to log in once on the STS login page and then be able to use all those applications. These techniques are called Single SignOn and Single SignOut. We will build on the MVC4 application we have been working on in this series of blog posts. Single SignOn is really nothing else but an application of the widely used “Remember Me” function. Say you have two web applications, SiteA and SiteB that share the same STS. You start the day by logging in to SiteA and do some work there. You’ll of course use the STS login page. The STS will establish a login session with the client. The browser will send the FedAuth cookie with all subsequent requests. Then at some point you need to use SiteB. SiteB also needs authentication and redirects the user to the same STS. However, the STS will recognise the user’s FedAuth cookie and will issue another token for SiteB without having to log in again. Therefore we get Single SignOn accross all applications that use the same STS. This requires some more steps. It is necessary to clean the local session cookie but it’s not enough. We need to inform the STS that we want to sign out, so please dear STS, end the auth session at your side too. The STS will need to clear its own session cookie so that the Single SignOn session is terminated. Optionally it can also tell the other relying parties that the user wants to sign out, but this is not mandatory. If you only clear the local session cookie of SiteA and the session at the STS, then when you go over to SiteB the STS will not recognise you any more as you killed the auth session. So you will need to sign in again. If you want to end the auth sessions in all relying parties you have accessed before you click the Logoff button then the STS will need to keep track of all apps you have used since your first log in. Then when you log out of SiteA then the STS will ‘contact’ SiteB to end the auth session there too. And possibly many possible solutions exist as to how to send the signoutcleanup message, the above HTML is not unique at all. The client browser will contact all the relying parties in the message and send them a signoutcleanup message. The idsrvauth cookie is the logon session with the STS itself. The wsfedsignout cookie is a tool for the STS to keep track of the relying parties the user has logged into. This is the effect of the Remember Me checkbox. The STS recognises the previously established logon session with the user and does not require the login name and password again. The STS simply issues a new auth token. This is the essence of Single SignOn and this is the solution for multiple relying parties on different web servers. This will only end the auth session in the MVC4 web app but not at the STS. Test it for yourself: run the application, click on ‘About’ and after logging in click the Log off link in the top right hand corner. You have successfully logged out of the MVC4 app. However, click About again. You will be redirected to the MVC4 without having to log in. This may be a good thing in some cases, but a Log off should mean LOG OFF, right? We first get a reference to the WS Federation authentication module. Then we clear the local cookie using the SignOut method. Then we construct a signout request message. The constructor requires the Issuer Uri and the Realm which will be read from the web.config. The WriteQueryString() method will form a valid ‘wsignout’ URL which will be understood by the STS. It will ‘know’ that the user wants to log out. You can set a breakpoint at ‘String queryString = signOutRequestMessage.WriteQueryString();’ to see what the signout request looks like. You’ll see the ‘wsignout’ command and the ‘wreply’ which provides a way to return to the calling application. Click ‘Return to the application” and the select the About link. You will see that you have to provide your username and password again on the STS homepage meaning that we successfully killed off the auth session at the STS as well. The session was ended at all relying parties in the STS records as well. In the previous post we looked at some basic features of WS-Federation in a .NET4.5 MVC4 web app. In this post we’ll dive into some advanced features around WS-Federation. The features will be presented in a demo at the end as usual. 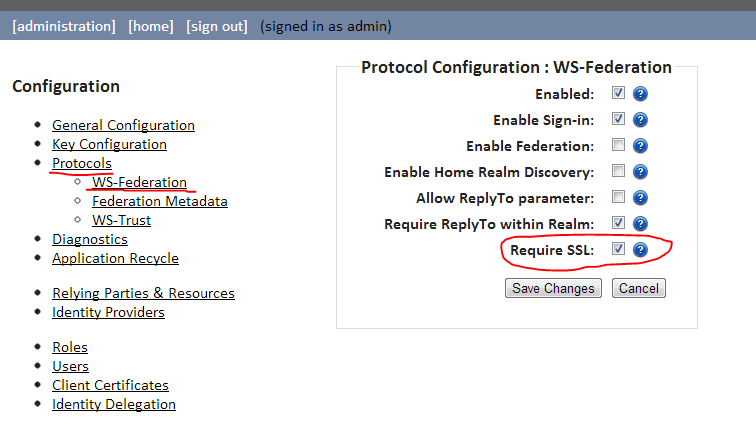 We saw in Part 2 how WS-Federation can be configured in web.config. Those settings are of course static. However, occasionally you may need to set some properties dynamically. You might have these values stored in a database or you need to query a web service for the right configuration. The incoming FederationConfigurationCreatedEventArgs has a property called FederationConfiguration. This property in turn has other properties, such as Name, ServiceCertificate, IdentityConfiguration, etc. that allow you to dynamically set the WS-Federation properties at runtime. Thus you get programmatic access to all WS-related configuration elements in web.config. Feel free to inspect what’s available using IntelliSense. The WSFederationAuthenticationModule, which is available as a property of FederationAuthentication has events similar to those of the SessionAuthenticationModule which we discussed before. You can then send the query string to the STS. This is the technique to be used with the Login link on your web page. As the web app does not have its own Login page any more the Login link needs to lead to the external STS using the query string constructed from the SignInRequestMessage object. We’ll see in the demo how this works. This will clear out the FedAuth session cookie. However, this will not sign you out of the STS. There’s a technique called Single SignOut which will do that for you. We won’t look at that in this blog post but in the next one. Sliding session token expiration was explained here. You use the same techniques in the case of WS-Federation. The effect is the same as before: not the entire Claims collection is serialised into FedAuth but only an identifier and the server will locate the serialised Claims collection using that token identifier. Here we have the chance to dynamically set these properties based on a DB lookup or a web service call or a similar mechanism. The SignInRequestMessage object can be used to redirect the user to the external Login page if the user clicks the Login link on the main screen. In a traditional forms-based app the user would then see the internal Login page but that is not an option any more. You pass in the STS login URI and the realm. I simply copied the values from web.config. Run the application now and click the generated Login link on the home page. If you set up the STS login URL correctly then you’ll be redirected to the STS where you can sign in. Upon successful login you’ll be redirected to the MVC4 web app with Hello, [username] in the top right hand corner meaning that you successfully logged in to you site. We modified the LogOut action before to make sure that the FedAuth cookie is removed. Press the ‘Log off’ link and you should then be logged out of the web site. Great! However, keep in mind what we said about the logoff method before: the session ended as far as the MVC application is concerned but is still alive on the STS side. Press the About link again and you should be automatically logged in without having to provide the username and password. You can end the STS session by a technique called Single SignOut which is one of the things we’ll look at in the next blog post among other features such as Single SignOn. In this post we’ll go into more details of WS-Federation in .NET4.5 using the MVC4 internet project we produced in the previous post. More specifically we’ll look at the changes that the Identity and Access Tool made to our project when we introduced the local STS. In the demo we’ll continue with the MVC4 application we started in the earlier posts. We’ll also test a real STS instead of the built-in local one. This login page is then an internal page of the web application. This was added by the Identity and Access Tool to web.config. Issuer is the URL of the login service. As you see it is an external URL as opposed to the relative one of the forms-auth solution. The realm is the identifier of your application, usually its URL. It is used by the STS to know who the token is meant for so that it can build application specific security tokens. This is located within the system.identityModel element. 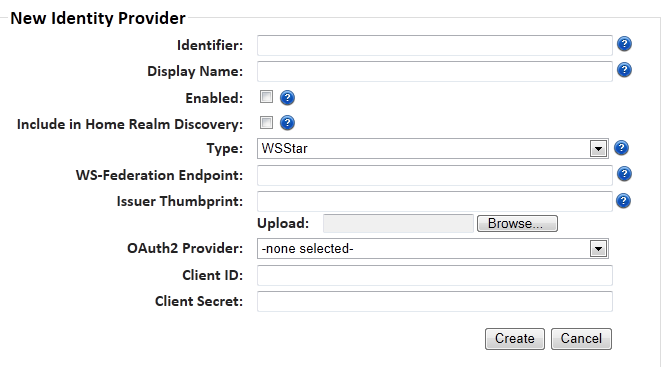 The issuerNameRegistry specifies the details of the trust relationship between the web app and the STS. You can specify a type, which will be a class that allows to set up the trust through configuration. There’s a built-in implementation called ValidatingIssuerNameRegistry which works just fine. You can provide your own solution by deriving from that class if you want to describe the trust relationship in another way, e.g. through a database. The above configuration is telling us the following: we have one valid, i.e. 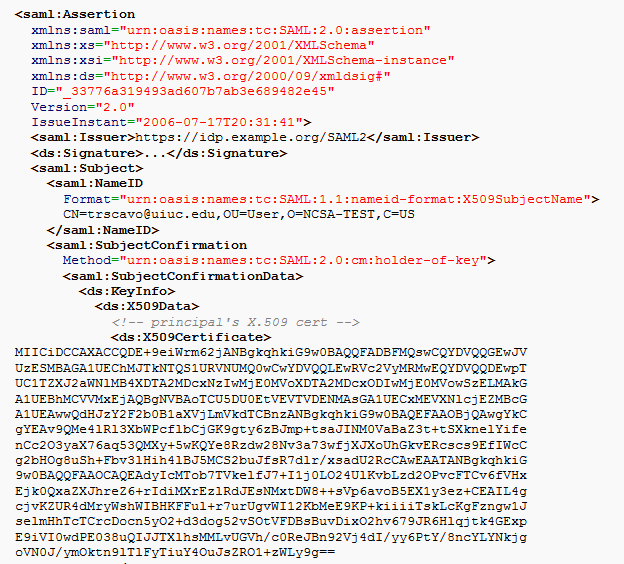 trusted issuer whose X509 signature -i.e. thumbprint – is 9B74CB2F320F7AAFC156E1252270B1DC01EF40D0 and bears the name ‘LocalSTS’. Our application will accept claims from this issuer. .NET will automatically look at the thumbprint of the issuer in the token and check the value(s) against the one in web.config. If the token was signed by a different X509 certificate then the token will be rejected. If the values match then the ‘Issuer’ property of the token will be assigned the symbolic name of ‘LocalSTS’. The ‘Isser’ property of each claim will receive this value as well. There’s an optional step after the token has been accepted by the web app, i.e. after the token has passed the first level of scrutiny which is checking the thumbprint. This will check if your certificate store includes a certificate with the same thumbprint and that it has not been revoked in the meantime. ChainTrust means that .NET will check if the specified issuer, i.e. LocalSTS is available in your trusted CA folder in your certificate store. revocationMode Online means that we want to go the CRL – Certificate Revocation List – endpoint of the CA to see if the certificate has been revoked. 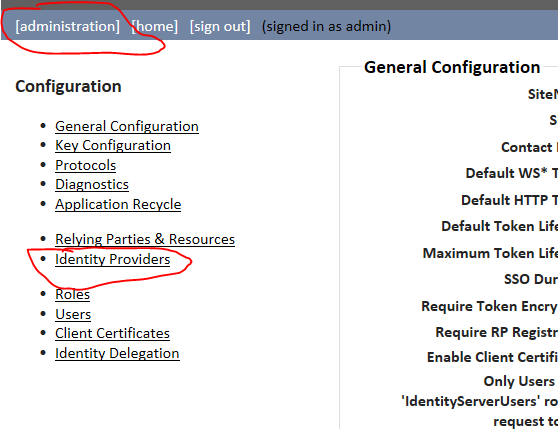 This is inserted by the Identity and Access Tool by default within the identityConfiguration node. Imagine that there are two applications that trust the same STS and that a token meant for myniceapplication is redirected to myotherniceapplication. As they both trust the same certificate then myotherniceapplication will also accept the token meant for myniceapplication. This can lead to subtle security holes that can be difficult to discover. The STS will embed the name of the realm in the token. Recall that the realm is also specified as the unique ID in the query string sent to the STS login page. The same value will be put back inside the token. The above audienceUri setting will check if the URI value, i.e. http://localhost:2532 is the same as the one embedded in the token. This will make sure that the token was really meant for our own web application. We will look at this document in more detail in the demo. Now we’ll see how to set up and use a real STS. Download the zip file containing the source code from the ‘Download’ link. Make sure you select version 2.1. 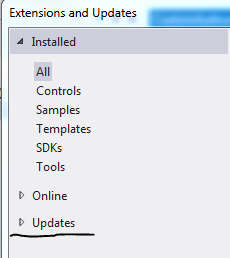 That is the most recent version available as of May 16 2013. The STS will need to be installed on your machine. There’s an easy step-by-step video guide available for version 2.0 under the ‘Documentation’ link. The video guide is available here. There are very little visual changes from v2.0 to 2.1 so you should be able to set up the system based on that guide. I will not recount what’s said there. So, follow the steps and come back here when you’re done. Make sure you follow each step carefully and that you’ll have 2 users ready: one admin and one ‘normal’ user who corresponds to the user we created before on the Register page of our MVC4 web app. I created a user with the same user name as the one I created on the Register page as my custom claims auth – CustomAuthorisationManager.cs – and claims transformation – CustomClaimsTransformer.cs – logic is based on that. If this is the case in your implementation then make sure that the username of the STS user matches the one you’ve been working with so far. Open our MVC4 internet application in Visual Studio 2012. 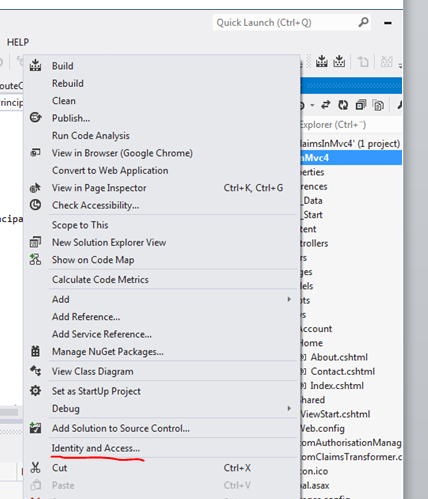 Right click the web project name and select ‘Identity and Access…’ from the context menu. In the previous blog post we tested the first option in the Identity and Access window, i.e. the ‘Use the Local Development STS to test your application’ one. This time select the second option, i.e. ‘Use a business identity provider’. You can also specify the realm, i.e. the ID of your web application in the same window. This can be the localhost URL as given in the wizard or some symbolic name, like DonaldDuck. Normally it is the URL of the web page, so we’ll leave it as it is for the time being. We inserted the system.identityModel and system.identityModel.services config sections in previous posts. However, the wizard would have inserted them for us if they had not been there already. The name of the Thinktecture STS is the default one which is provided during the STS installation process. You’ll notice that the name of the issuer is the same as the Site ID we chose when we set up the STS. It is important that the two values are the same, otherwise you will get a strange WIF exception: WIF10201: No valid key mapping found for securityToken: ‘System.IdentityModel.Tokens.X509SecurityToken’ and issuer: ‘http://identityserver.v2.thinktecture.com/trust/changethis&#8217;. You’ll notice that the attributes ‘requireSsl’ and ‘requireHttps’ in the above XML are set to false. This is acceptable for testing purposes but you should make sure to set have SSL ready for the production environment. ‘passiveRedirectEnabled=true’ means that upon a 401 response the user is redirected to the login page of the STS, i.e. at https://localhost/IdentityServer/issue/wsfed in this example. The realm http://localhost:2532 will be attached to the query string as the ID of our web site. This value is typically the same as the realm under the federationConfiguration element. The effect is that as soon as a user tries to view your site they will be redirected to the STS. Let’s remove this element to allow anonymous users as well. Run the application now. You may be presented with an exception saying that the element ‘certificateValidation’ occurs more than once. We added this element in the previous post and the wizard was not smart enough to detect it in web.config. If you get this exception then remove one of the elements and re-run the application. Navigate to the STS home page and sign in as an admin. If you followed the video presentation on the Thinktecture STS installation then you’ll have an admin user ready. Re-run our MVC4 demo application and click the About link… …and you’ll most likely receive one more exception: the return URL requires SSL. Didn’t we specify ‘requireSsl’ as false in the web.config file? It turns out that SSL must be disabled on the STS as well. Save the changes and run the MVC4 application again. As usual, you can set breakpoints within CustomClaimsTransformer.Authenticate and CustomAuthorisationManager.CheckAccess to see if our custom made claims managers still work. Select About and you should be redirected to the STS login page. Enter the username and password of the ‘normal’ user you created during the Thinktecture Identity Server installation process and press ‘Sign In’. You should be redirected to the About page meaning that the logi nwas successful. If you have set the breakpoints in place then you’ll see that code execution stops within our custom claims managers showing that they still work as expected. Feel free to step through the code with F11 and inspect how the Claims collection is built up. If everything went fine then you’ll be presented with the About page. Great, we’ve just implemented a real STS solution! In addition, all our custom Claims auth managers work exactly the same as before. In the next post we’ll discuss some more advanced topics. Our model MVC4 internet applications in this series had one important feature in common: they all provided the authentication logic internally. This is the traditional approach to logging in on a web page: there is a login page within the application which provides the gateway to the protected parts of the website. Upon providing the login credentials and pressing the ‘Log in’ button the web application will check the the validity of those credentials against some data store and accept or reject the request. We will build on the demo application from the previous post on claims in MVC4. If you are new to Claims in .NET4.5 then I’d recommend that you start from the beginning. 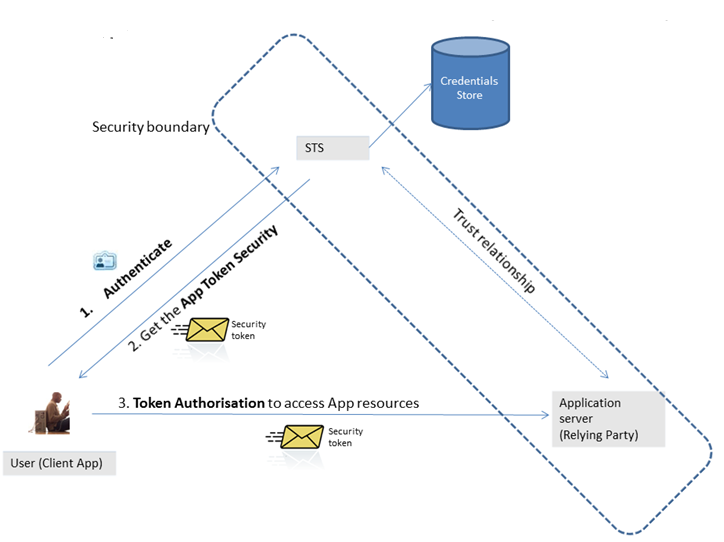 You can put the external auth app anywhere: on a different physical server, in the cloud, behind some web service, etc. What would such a scenario look like? First I’ll try to describe the scenario in words. The external authentication app we have been talking about is called a Security Token Service, or an STS in short. It is also called an Identity Provider. The STS is a normal website with its own login page sitting on some web server. The security token is meaningless for the client. As mentioned above, it will be used by your web app to check its validity, transform the claims etc. Also, just to stress the point, it is not important any more where the STS is located. You’ll see the Issuer, the X509 cert data, i.e. the digital signature and the NameID in the picture. The signature will be used to see if the token has been tampered with after it left the STS and if the issuer is a trusted one. There’s typically not much else shown in a SAML token. It is up to the STS what kind of data it will include in the SAML token. The STS may provide a different set of initial claims depending on the type of application wishing to be authenticated. The good news is that you will not have to work with SAML directly; .NET will translate the XML into Claims automatically. It is also important to note that if you have complete control over the STS then it is up you what you include in the SAML: anything from UserId to EyeColour and FavouriteBand can be sent along. It’s important to stress that this is not some Microsoft specific framework targeting .NET applications only. WS-Federation is part of the larger WS* family of web service specifications. It can happen that you have an STS built with .NET and a Ruby on Rails web app that you would like to connect to the STS. The fact that the STS was implemented using .NET is an unimportant detail in the bigger picture as the communication is based on a widely accepted standard. If you are in this situation then you need to check if Ruby has built-in support for WS-Federation, which I’m pretty sure it does although I know precious little about that framework. .NET4.5 includes base classes that allow you to build your own STS. Beware though that this is not a trivial exercise. You must be very knowledgeable and experienced in programming Security. 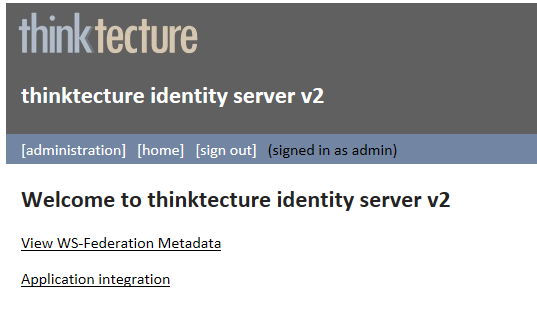 There’s an open source STS available on GitHub: Thinktecture IdentityServer which we’ll take a closer look at in the next blog post. For now you won’t need any of the real STS solutions out there while developing your solution. 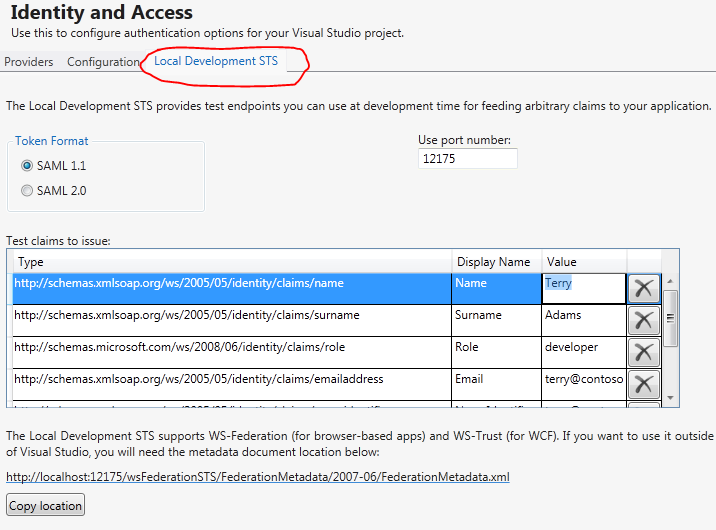 You can download an extension to Visual Studio which enables you to use a Development STS with pre-set claims. We will use this in the demo. You will need to download and install the Identity and Access Tool extension from here for the demo. This is a great tool for development purposes; you won’t need a real STS but you can still write your code that accepts the security token as if it comes from a real STS. Then when you’re done you simply replace the tool with the STS of your choice. Open the MVC4 application from the previous post. As it currently stands this application still uses Forms-based authentication and we’ll try to convert it to a Claims-based one. 4. There is no authorization element, meaning we let anonymous users view the unprotected pages of the website. You will see a list of test claims that the web application will receive, such as the name ‘Terry’. Again, keep in mind that there’s no way to directly log on to a fully claims-based web app; here we pretend that an external STS is sending these claims to your application after a user has successfully signed in on the login page of the STS. You can configure this list according to the needs of your token validation and authorisation logic. Change the value of the name claim, i.e. the very first one to the name of the user you created in the previous blog posts, so I’ve changed mine to ‘Andras’. You can select the SAML version: either 1.1 or 2.0. This depends on the available versions of the STS of your choice. In our case it doesn’t make any difference, so leave option 1.1 selected. When I published the first version of this post – some time in March 2013 – the above XML was slightly different. I updated the Identity and Access Tool on 12 May 2013 which yielded the above system.identityModel node. It is possible that when you read this post the Access Tool will again yield something different. Let me know in the comments section if you notice a change and I’ll update this post accordingly. If you started VS in admin mode then you shouldn’t see this, I’ll just restart mine. …and also establishes the authentication session as per the CreateSession method. Now click the About link on the front page. As this is a protected page code execution will stop within CustomAuthorisationManager.CheckAccess which shows that even this custom manager class works as it should. Upon successful authorisation the About page should load as expected. So our previous investments are still worth the effort. The external login doesn’t invalidate our claims authentication and claims transformation logic. In the next post we’ll look at the changes in web.config in more details and hook up our MVC4 with a real STS. In the previous post we discussed how to the save the authentication session so that we didn’t need to perform the same auth logic on every page request. In this post we will look at how authorisation can be performed using claims in an MVC project. There are two main approaches to authorisation in an ASP.NET web application: pipeline authorisation and Intra-app authorisation. Pipeline auth means performing coarse grained, URL-based authorisation. You may require the presence of a valid auth header in every request that comes to your server. Or the authenticated user must be in a certain Role in order to reach a certain protected URL. The advantage with this approach is that authorisation happens very early in the application lifecycle so you can reject a request very early on. In this scenario you will typically have little info about the user and what resource they are trying to access but these can be enough to reject a large number of users. An example of pipeline auth in our simple MVC4 web we’ve been working on this series can be found in CustomClaimsTransformer.Authenticate. This is the stage where you can check the presence of a certain claim that your auth logic absolutely must have in order to make an early decision. If it’s missing, then you may not care about what the user is trying to do, the request will be rejected. This is an acceptable approach in web-forms projects where the URL has a close affinity to the project file system, i.e. the value of the ‘path’ attribute represents an .aspx file. In MVC /Customers will of course not lead to an aspx page called Customers. In MVC urls and resources are unlikely to have a one-to-one match. You don’t call physical files the same way as in a web-forms app. If the routing mechanism is changed then the path attribute will be meaningless. So all of a sudden people will have access to previously protected parts of your web app. Generally try to avoid this approach in an MVC application as it creates a tight coupling between the routing table and the project file structure. Yet another example of pipeline auth is the ClaimsAuthorisationManager which can be registered in the web.config. This will sound familiar to you if you looked at the post on the very basics of claims. This is also a URL based approach, but it’s based on Claims and not Roles. Intra-app auth on the other hand means fine-grained checks within your code logic. The benefit is that you have the chance to collect as much information as possible about the user and the resources they are trying to use. Then you can tweak your authorisation logic on a wider information basis. In this scenario you will have more info on the user and make your reject/accept decision later in the app lifecycle than in the Pipeline auth scenario. A definite advantage of this approach is that it is not URL based any more so it is independent of the routing tables. You will have more knowledge about the authorisation domain because you’ll typically know exactly what claims the user holds and what they are trying to achieve on your site. The old way of performing authorisation is not recommended now that we have access to claims in .NET4.5. Roles encouraged you to mix authorisation and business logic and they were limited to, well, Roles as the way of controlling access. However, you might have required more fine-grained control over your decision making. Then you ended up with specialised roles, like Admin, SuperAdmin, SuperSuperAdmin, MarketingOnThirdFloor etc. Decorating your methods with the PrincipalPermission attribute also disrupts unit testing as even the unit testing thread must have a User in the Role specified in the attribute. Also, if the current principal is not in the required group then an ugly security exception is thrown which you have to deal with somehow. In short: we don’t care which group or role the user is in any longer. This attribute describes the method it decorates. It involves a ‘Show’ operation on the ‘Code’ resource. If the current user wants to run this method then they better make sure that they have these claims. It will be the ClaimsAuthorizationManager that decides if the current principal is allowed to call the action ‘Show’ on the resource ‘Code’. The principal still must have certain claims, just like they had to be in a certain Role before. However, the authorisation logic is now separated out to a different part of the application. You can even have that logic in a web service on a different machine so that the auth logic can be handled entirely separately from your application. Another benefit is the following: what constitutes a certain Role can change over time. What is ‘IT’? Who belongs to that group? So later on you may have to come back to every method with the attribute ‘Role=”IT”‘ and change it to e.g. “Geeks” because ‘IT’ has changed its definition at your company. On the other hand a method that has the function to ‘Show’ a resource called ‘Code’ will probably have that function over a long time, possible over the entire life time of the finalised production version of the application. So, this attribute solves some of the problems with the PrincipalPermission. However, it does not solve all of them. It still gets in the way of unit testing and it still throws a SecurityException. It does not use the action/resource properties of the method and you still mix your auth logic with the ‘real’ application code leading to the same Separation of Concerns problem we mentioned above. However, this attribute is not invoked during unit testing and it does not throw Exceptions either. Instead, it returns a 404 which is a lot nicer way of dealing with unauthorised access. We are only one step from the MVC4 claims-based authorisation nirvana. It would be great to have an Authorize attribute where you can specify the Resource and the Action just like in the case of ClaimsPrincipalPermission. You could derive from the existing Authorize attribute and implement this kind of logic there. The good news is that this has been done for you and it can be downloaded from NuGet. The NuGet package includes the imperative equivalent of the declarative attribute as well. So if you need to check if the user has access rights within a certain method, then there’s a claims-enabled solution in MVC4. We’ll use this attribute in the demo. The initial steps of building the authorisation module have been outlined in this blog post. I will not repeat all of the details here again. Open up the project where we left off in the previous blog post. If you remember then we included a CustomClaimsTransformer class to implement our own claims transformation logic. This is our claims based authentication module. We would like to extend the project to include authorisation as well. Recall that you can extract the Resource, the Action and the Principal from the AuthorizationContext object parameter. Set a breakpoint at the first row of the method body, we’ll need it later. This should be straightforward: we extract the Action and the Resource – note that there can be multiple values, hence the ‘First()’ – and then check where the user lives and what their given name is. If those claims are missing or are not set to the required values then we return false. The type attribute is formatted as follows: [namespace.classname],[assembly]. This package will give you access to a new attribute called ClaimsAuthorize where you can pass in the Action and Resource parameters. Imagine that our About page includes some highly sensitive data that can only be viewed by the ones specified in CustomAuthorisationManager.CheckAccess. So let’s decorate the About action of the Home controller. Note that the attribute comes in two versions: one for MVC4 and one for WebAPI. If you haven’t heard of Web API, then it is a technology to build RESTful web services whose structure is very much based on MVC. You can read more about it here. This is telling us that the About action will perform a ‘Show’ action on the resource called ‘Code’. If the logged on user has the correct claims then you should be redirected to the About page. I will here again stress the point of getting away from the traditional Roles based authorisation of ASP.NET. We are not dealing with Roles any longer. We do not care who is in which group. Instead we describe using the Action and Resource parameters of the ClaimsAuthorize attribute what the logged on user is trying to achieve on our website. Based on that information we can make a better decision using the claims of the user whether to allow or deny access. The auth logic is separated away from the ‘real’ application in a class on its own which is called automatically if it is registered in web.config. The auth logic can even be ‘outsourced’ to a web service which can even be the basis of a separate user management application. …i.e. you just pass in the names of the Resources after the Action. The CheckAccess method has an overloaded version which accepts an AuthorizationContext object, which gives the highest degree of freedom to specify all the resources and actions that are needed by the auth logic. This discussion should be enough for you to get started with Claims-based authentication and authorisation in an MVC4 internet application. In the next post we’ll start looking at separating out the login mechanism entirely: Single SignOn and Single SignOut. In the previous post we built a simple claims-aware MVC4 internet application. We saw that calling the Authenticate method in CustomClaimsTransformer.cs with every page refresh might not be desirable. In this post we’ll look at caching possibilities so that we don’t need to look up the claims of the user in the DB every time they request a page in our website. You can immediately see the benefit: we skip the claims transformation step after the first page request so we save the potentially expensive DB lookups. By default the authentication session is saved in a cookie. However, this is customisable and there are some advanced scenarios you can do with the auth session. The authentication session is represented by an object called SessionSecurityToken. It is a wrapper around a ClaimsPrincipal object and can be read and written to using a SessionSecurityTokenHandler. Open the MVC4 project we started building in the previous post. In order to introduce auth session caching we need to start with our web.config, so open that file. Build the application so that even IntelliSense will be aware of the new config sections when you modify web.config later on. Remember to turn it on again for the production environment and install your X509 certificate. This module will be activated at the post-authentication stage. It will attempt to acquire the auth cookie and turn it to a ClaimsPrincipal. The type value is built up as follows: [namespace.class],[assembly]. You can find the assembly name under the project properties. We create a SessionSecurityToken object and pass in the transformed principal and an expiration. By default the auth session mechanism works with absolute expiration, we’ll see later how to implement sliding expiration. Then we write that token to a cookie. From this point on we don’t need to run the transformation logic any longer. Go to Global.asax and comment out the Application_PostAuthenticateRequest() method. We don’t want to run the auth logic upon every page request, so this is redundant code. We first create an initial set of claims. We only add in the Name claim as it is sufficient for our demo purposes but you’ll need to pass in everything that’s needed by the claims transformation logic in the custom Authenticate method. Then we create a new ClaimsPrincipal object and pass it into our transformation logic which in turn will fetch all the necessary claims about the user and set up the auth session. Note that we new up a ClaimsAuthenticationManager by a long chain of calls, but what that does is that it extracts the registered auth manager from the web.config, which is CustomClaimsTransformer.cs. We finally call the Authenticate method on the auth manager. This code is slightly more complicated than in pure Forms based auth scenarios where a single call to FormsAuthentication.SetAuthCookie would have sufficed. However, you get a lot more flexibility with claims; you can pass in a whole range of input claims, can call your claims transformation logic and you also get a cookie that serialises the entire claim set. Set a breakpoint at the first row of CustomClaimsTransformer.Authenticate. Run the application now. There should be no visible difference in the behaviour of the web app, but the underlying authentication plumbing has been changed. One difference in code execution is that the Authenticate method is not called with every page request. Step through the code in CustomClaimsTransformer.cs and you’ll see that the SessionSecurityToken has been established and written to a cookie. I highlighted ‘FedAuth’ which is the default name given the authentication session cookie. Its value is quite big as we’re serialising a whole claim set. Don’t worry much about the size of this long string. If the serialised value becomes too big, then the part that does not fit into FedAuth will be added to another cookie called FedAuth1 and so on. Cookies are partitioned into chunks of 2KB. You may be wondering what the .ASPXAUTH cookie is doing there, which is the traditional auth cookie set in a forms-based authentication scenario. If you check the code in the Login action again you’ll see a call to WebSecurity.Login. It is here that the .ASPXAUTH cookie will be set. You can read more about WebSecurity in my previous blog posts on Forms auth here and here. Try again to log on and off, you should succeed. SessionSecurityTokenReceived event is useful if you want to set a sliding expiration to the auth session. It’s generally a bad idea to set a sliding expiration to a cookie; a cookie can be stolen and with sliding expiration in place it can be used forever if the expiry date is renewed over and over again. So normally the default setting of absolute expiration is what you should implement. You will have access to the current session token in the incoming SessionSecurityTokenReceivedEventArgs parameter. Here you have the chance to inspect the token as you wish. Here we set the SessionToken property to a new token – I omitted the constructor parameters for brevity. You can obviously use the same session creating logic as in the CreateSession method, the CreateSessionSecurityToken is just another way to achieve the same goal. …and run the application. Code execution will stop at the break point when logging in. The event will be then raised on every subsequent page request and the session security token will be reissued over and over again. It is a good idea to protect the auth session cookie so that it cannot easily be read. Fortunately the session token is by default protected by the token handler using DPAPI. The key that’s used to encrypt the token is local to the server. This means that you will run into problems in a web farm scenario where each server has a different machine key. In this case you’ll need a shared key. You can build a new class that derives from SessionSecurityTokenHandler and set your encryption logic as you wish. Alternatively starting with .NET4.5 there’s a built-in token handler that uses the ASP.NET machine key to protect the cookie. You can find more details on the MachineKeySessionSecurityTokenHandler class on MSDN. The shared key material will be used to protect the cookie. It won’t make any difference which server the browser connects to. The downside is that the cookie is linked to server, i.e. we have to deal with server-affinity; if the app pool is refreshed, e.g. when you deploy your web app, or reset IIS, then the claims will be lost. Also, this solution does not work out of the box in the case of web farms. A way to solve this is to introduce your own implementation of SessionSecurityTokenCache (Read on MSDN) to connect to another server dedicated to caching, such as AppFabric caching. This post discussed the properties of the authentication session. In the next post we’ll look at claims-based authorisation in MVC4.